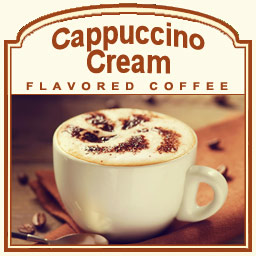 If you love to curl up with a foamy cappuccino and relish in its deep flavor, look no further than this Cappuccino Cream flavored coffee. Made with 100% authentic Arabica beans, you can now enjoy the flavors of a cappuccino without all the fuss. With a rich creaminess in addition to the caramel-esque flavor, your taste buds will go gaga for this 2 calorie cup of coffee. Packaged in a heat-sealed valve bag to ensure the freshest Cappuccino Cream flavored coffee possible, this gourmet flavored creation will be roasted and shipped on the same day. Go ahead, pretend you're at a fancy coffeehouse sipping on a foamy cup of cappuccino with this flavored coffee...you won't be able to tell the difference between the two!